Here is our monthly summary of RV recalls for November 2018 and related equipment we feel are of interest to our readers. This information has been gleaned from the U.S. National Highway Transportation Safety Administration. This is NOT a complete list of all vehicles and related equipment recalled. Do you shop at Amazon? If so, would you use one of the links below to do your shopping? The link in the blue bar above also works. We get a tiny commission on what you buy. Even though our commission is small, at the end of the month it adds up, which helps fund this newsletter and our projects. Thanks. Forest River, Inc. (Forest River) is recalling certain 2017-2019 Forest River Georgetown and FR3 motorhomes, 2018-2019 Berkshire motorhomes and 2018 Charleston motorhomes. The motorized windshield roller shade at the driver’s seating position may unroll without warning while driving. If the windshield roller shade unrolls while driving, it could block the driver’s visibility, increasing the risk of a crash. Forest River will notify owners, and dealers will install a fastener to ensure the motor will not allow the shade to roll down while driving. Owners may contact Forest River customer service at 1-574-206-7605. Forest River’s number for the recall is 68-0822. Forest River, Inc. (Forest River) is recalling certain 2018-2019 Cherokee Alpha Wolf and 2019 Cherokee Arctic Wolf recreational trailers. The awnings may have been mounted with fasteners that are insufficient in length and/or quantity, possibly resulting in the awning arm detaching from the wall. If the awning arm detaches, it can increase the risk of injury or a crash. The remedy for this recall is still under development. The recall began November 27, 2018. Owners may contact Forest River customer service at 1-260-499-2100. Forest River’s number for this recall is 75-0867. Grand Design RV, LLC (Grand Design) is recalling certain 2019 Grand Design Reflection travel trailers, models 285BHTS, 287RLTS and 297RSTS. The wires to the 50-amp mini-breaker may be installed incorrectly, leaving the circuit unprotected. If the unprotected circuit overheats or experiences a short, it can increase the risk of a fire. Grand Design will notify owners, and dealers will inspect the 50-amp mini-breaker to make sure that it is wired correctly, re-wiring it as necessary, free of charge. The recall began November 12, 2018. Owners may contact Grand Design customer service at 1-574-825-9679. Grand Design’s number for this recall is 910016. Grand Design RV, LLC is recalling certain 2018-2019 Reflection fifth wheel trailers, models 28BH and 29RS. The circuit for the power converter does not have over-current protection. An electrical short circuit in the unprotected circuit can increase the risk of a fire. Grand Design RV will notify owners, and dealers will inspect the trailers to determine if the 50-amp mini breaker at the bus bar is installed correctly and that the circuit is wired correctly, correcting it as necessary, free of charge. The recall began November 19, 2018. Owners may contact Grand Design RV customer service at 1-574-825-9679. 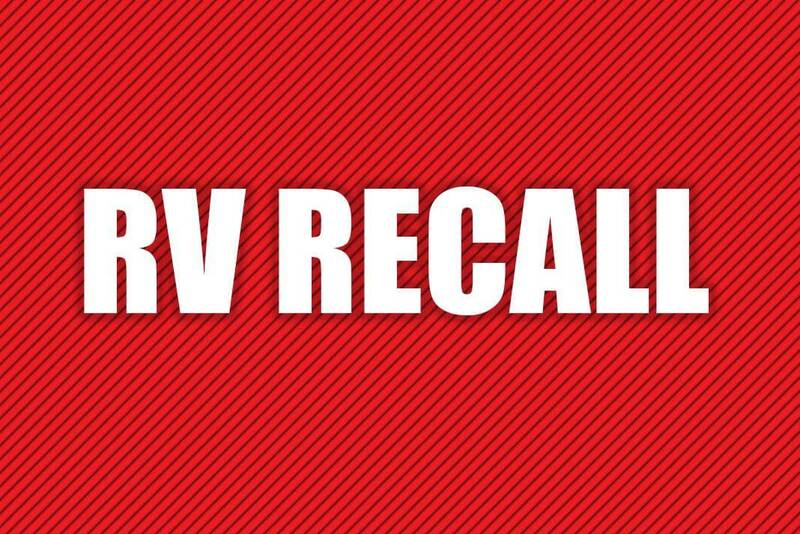 Grand Design RV’s number for this recall is 910017. Heartland Recreational Vehicles, LLC (Heartland) is recalling certain 2019 Heartland Pioneer recreational trailers, model BH280. A flexible liquid propane (LP) hose was installed on the outside cooktop running into the firebox of the stove instead of a rigid metal tube supply line. Heat from the cooktop can damage the hose, increasing the risk of a fire. Heartland will notify owners, and dealers will replace the flexible LP hose inside the firebox with a rigid metal one, free of charge. The recall began November 16, 2018. Owners may contact Heartland customer service at 1-877-262-8032. Heartland’s number for this recall is 99.01.41. Keystone RV Company (Keystone) is recalling certain 2019 Keystone Montana recreational trailers with the Legacy package. The fasteners that secure the disc brake assembly may fail. If the fasteners fail, the trailer would lose all braking ability, increasing the risk of a crash. Keystone will notify owners, and dealers will replace the brake disc mounting fasteners, free of charge. The recall is expected to begin November 30, 2018. Owners may contact Keystone customer service at 1-866-425-4369. Keystone’s number for this recall is 18-336. Thor Motor Coach (TMC) is recalling certain 2017 Tuscany XTE and 2017-2019 Venetian, Aria, Tuscany, and Palazzo motorhomes built on Freightliner Custom Chassis Corporation chassis. The Power Distribution Module (PDM) may have been damaged during manufacturing, possibly resulting in the rear marker lights, brake lights, or turn signals not functioning. Nonfunctioning lights can increase the risk of a crash. The remedy for this recall is still under development. Daimler Trucks North America, the manufacturer of the chassis began issuing owners an interim notification on October 24, 2018, and will send a second notification when parts become available. The recall began October 30, 2018. Owners may contact TMC customer service at 1-877-855-2867. TMC’s number for this recall is RC000163. Thor Motor Coach (TMC) is recalling certain 2018-2019 Thor Aria and Venetian motorhomes. The brake caliper mounting bolts may have been insufficiently tightened. Loose brake caliper mounting bolts can reduce brake effectiveness, increasing the risk of a crash. TMC will notify owners, and Daimler Trucks North America (DTNA) authorized service facilities will check and tighten the brake caliper mounting bolts, free of charge. The recall is expected to begin January 5, 2019. Owners may contact TMC customer service at 1-877-855-2867. TMC’s number for this recall is RC000164. Thor Motor Coach (TMC) is recalling certain 2018-2019 Thor Four Winds, Chateau, and Freedom Elite vehicles. The liquid propane (LP) hose may not have adequate space between the floor and the metal plate on the refrigerator, causing damage to the hose and possibly creating a propane leak. A propane leak can increase the risk of a fire. TMC will notify owners, and dealers will remove a portion of the refrigerator base plate to provide additional clearance for the LP hose, free of charge. The recall is expected to begin December 11, 2018. Owners may contact TMC customer service at 1-877-855-2867. TMC’s number for this recall is RC000162. Triple E Recreational Vehicles (Triple E) is recalling certain 2019 Triple E Unity motorhomes, models U24MB, U24CBB, U24TB, U24IX and U24FX. The driver-side front trans-mount leveling jack support bracket may contact the brake line causing a brake fluid leak, thereby reducing braking ability. A reduction in braking ability can increase the risk of a crash. Triple E will notify owners, and dealers will relocate the leveling jack support bracket, as necessary, free of charge. The recall began November 20, 2018. Owners may contact Triple E customer service at 1-877-992-9906. Triple E’s number for this recall is CA#9146-1. Any RVer that has been on the road for awhile likely has a dog-eared and ragged copy of Don Wright’s “Guide to Free Campgrounds.” It’s been four years since the latest edition, and much has changed and been added. Read more about it here, and maybe order a copy of the brand-new 832-page guide for yourself or for a Christmas gift for your RVing friends. Chrysler (FCA US LLC) is recalling certain 2018 Jeep Grand Cherokee Street and Racing Technology (SRT) and Trackhawk vehicles. The driver’s floor mat may have insufficient clearance between the mat and the accelerator pedal, possibly preventing the pedal from returning to the idle position. If the floor mat prevents the accelerator pedal from returning to idle, there would be an increased risk of a crash. Chrysler will notify owners, and dealers will replace any of the affected floor mats, free of charge. The recall began November 15, 2018. Owners may contact Chrysler customer service at 1-800-853-1403. Chrysler’s number for this recall is UB3. Chrysler (FCA US LLC) is recalling certain 2018 Jeep Wrangler four-door vehicles. The right rear passenger door latch may not be in the correct location, possibly preventing the door from latching properly. If the right rear passenger door opens unexpectedly, it can increase the risk of injury. Chrysler will notify owners, and dealers will repair the right rear door latch reinforcement, free of charge. The recall is expected to begin December 28, 2018. Owners may contact Chrysler customer service at 1-800-853-1403. Chrysler’s number for this recall is UB6. Daimler Vans USA, LLC (DVUSA) is recalling certain 2018 Freightliner Sprinter 2500 and 3500 and Mercedes-Benz Sprinter 2500 and 3500 vehicles. The right side door latches may have been built with incorrect components. As a result, when the doors are electronically unlocked, the right-side doors may not be able to be opened from inside or outside of the vehicle. In the event of a crash, if the right side doors cannot be opened, it could increase the risk of injury. DVUSA will notify owners, and dealers will inspect and replace the locks if necessary, free of charge. The recall is expected to begin December 11, 2018. Owners may contact DVUSA at 1-877-762-8267. Ford Motor Company (Ford) is recalling certain 2018 Ford Explorer vehicles equipped with 2.3L or 3.5L GTDI engine. Due to an assembly error, the fuel pressure sensor may leak fuel. A fuel leak in the presence of an ignition source can increase the risk of a fire. Ford will notify owners, and dealers will replace the fuel line assembly, free of charge. The recall is expected to begin December 3, 2018. Owners may contact Ford customer service at 1-866-436-7332. Ford’s number for this recall is 18S35. General Motors LLC (GM) is recalling certain 2019 Buick Encore, Chevrolet Spark, Traverse, and Trax vehicles. The Sensing Diagnostic Module (SDM) on these vehicle may not have been turned off of “manufacturing mode,” preventing the air bags from deploying in the event of a crash. If the air bags do not deploy in the event of a crash, it can increase the risk of injury. GM will notify owners, and dealers will reprogram the SDM module to the correct mode, free of charge. The recall began November 6, 2018. Owners may contact Buick customer service at 1-800-521-7300 and Chevrolet customer service at 1-800-222-1020. GM’s number for this recall is 18365. Honda (American Honda Motor Co.) is recalling certain 2017-2019 Acura MDX, 2017-2018 Acura MDX Sport Hybrid, 2018-2019 Honda HR-V and Honda Odyssey, and 2016 Honda HR-V vehicles. The rear brake caliper pistons may have an insufficient coating, causing gas pockets to form, reducing brake performance. As such, these vehicles fail to comply with the requirements of Federal Motor Vehicle Safety Standard (FMVSS) number 135, “Light Vehicle Brake Systems.” A reduction of braking performance increases the risk of a crash. Owners will be notified, and Honda or Acura dealers will bleed the brakes, free of charge. The recall is expected to begin December 17, 2018. Owners may contact Honda customer service at 1-888-234-2138. Honda’s numbers for this recall are C31 and L30. Honda (American Honda Motor Co.) is recalling certain model year 2018 and 2019 Honda Odyssey vehicles. The latch assemblies for the power sliding doors may stick and not properly latch to the door strikers. If the power sliding doors fails to latch, the doors may open while moving, increasing the risk of injury. Honda will notify owners, and dealers will replace the left and right power sliding door rear latch assemblies, free of charge. The recall is expected to begin December 20, 2018. Owners may contact Honda customer service at 1-888-234-2138. Honda’s numbers for this recall are Z33 and O36. Southeast Toyota Distributors, LLC (SET) is recalling certain 2017-2019 Toyota 4Runner vehicles that SET modified to be equipped with a TRD wheel package. The Gross Vehicle Weight Rating (GVWR) on the certification label may be incorrect, possibly resulting in the vehicle being overloaded. As such, these vehicles fail to comply with the requirements of Federal Motor Vehicle Safety Standard (FMVSS) number 110, “Tire Selection and Rims.” An overloaded vehicle can increase the risk of a crash. SET will notify owners and mail them corrected certification labels, free of charge. The recall began November 28, 2018. Owners may contact SET customer service at 1-866-405-4226. SET’s number for this recall is SET18A. Subaru of America, Inc. (Subaru) is recalling certain 2012-2014 Subaru Impreza, 2012-2013 Impreza Stationwagon, 2013 Subaru BRZ, XV Crosstrek and Toyota Scion FR-S vehicles. The engine valve springs in these vehicles may fracture causing an engine malfunction or a possible engine stall. An engine stall can increase the risk of a crash. Subaru will notify their owners. Toyota will notify the FR-S owners. Dealers will replace the valve springs, free of charge. The manufacturer has not yet provided a notification schedule. Subaru owners may contact Subaru customer service at 1-844-373-6614, Toyota owners may contact the Toyota Customer Experience Center at 1-888-270-9371. Subaru’s number for this recall is WTY-84. Subaru of America, Inc. (Subaru) is recalling certain 2018 Subaru Legacy and Outback vehicles. Due to a software error, the low fuel warning light may not illuminate at the intended remaining fuel level and the miles-to-empty display may incorrectly indicate a positive number despite the tank being empty. The inaccurate fuel display may cause a driver to unexpectedly run out of fuel and the vehicle to stall, increasing the risk of a crash. Subaru will notify owners, and dealers will reprogram the combination meter software, free of charge. The manufacturer has not yet provided a notification schedule. Owners may contact Subaru customer service at 1-844-373-6614. Subaru’s number for this recall is WTW-82. Yokohama Tire Corporation (Yokohama) is recalling certain Yokohama RY023 tires, size 295/75R22.5 (14G), that have DOT date code 2318. The rubber compound may be incorrect, possibly resulting in the tread separating from the casing. As such, these tires fail to comply with the requirements of Federal Motor Vehicle Safety Standard (FMVSS) number 119, “New Pneumatic Tires-Other than Passenger Cars.” If the tread separates, the driver may experience a loss of control, increasing the risk of a crash. Yokohama has notified owners, and dealers will inspect and replace the tires, as necessary, free of charge. The recall began November 28, 2018. Owners may contact Yokohama customer service at 1-800-722-9888. Please note: This is only a list of recalls we feel may be of interest to the RVing community. There may be other recalls which may affect you — please make it a point to visit appropriate government sources for more information. When a manufacturer or the National Highway Traffic Safety Administration (NHTSA) determines that a car or item of motor vehicle equipment creates an unreasonable risk to safety or fails to meet minimum safety standards, the manufacturer is required to fix that car or equipment at no cost to the consumer. That can be done by repairing it, replacing it, offering a refund (for equipment) or, in rare cases, repurchasing the car. What should I do if my vehicle is included in this recall? If your vehicle is included in this recall, it is very important that you get it fixed as soon as possible given the potential danger to you and your passengers if it is not addressed. You should receive a separate letter in the mail from the vehicle manufacturer, notifying you of the recall and explaining when the remedy will be available, whom to contact to repair your vehicle or equipment, and to remind you that the repair will be done at no charge to you. If you believe your vehicle is included in the recall, but you do not receive a letter in the mail from the vehicle manufacturer, please call NHTSA’s Vehicle Safety Hotline at 1-888-327-4236, or contact your vehicle manufacturer or dealership. Thank you for your attention to this important safety matter and for your commitment to helping save lives on America’s roadways. The National Highway Traffic Safety Administration is the agency which handles vehicle recalls. • Here is a link to the main NHTSA website, which covers everything they do. • Here’s a link to where you can enter your vehicle’s VIN to see if it has ever been involved in a recall. • Here is the link if you ever want to file a vehicle safety complaint. Did you miss last week’s issue of RV Travel? You can read it here. This newsletter is copyright © 2018 by RVtravel.com. Previous articleRV Electricity – Don’t blow your fuse!